When it comes to gardens, bigger isn’t always better. A larger space requires more plants, more furniture, more maintenance, and more time. A smaller space takes less time to design, install, and care for and makes it easier for gardeners to take advantage of every square foot of space. 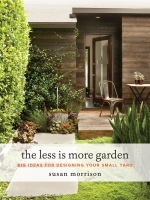 The Less Is More Garden shows you how to take advantage of a small yard. Designer Susan Morrison offers dozens of savvy tips on how to personalize a space to match a specific lifestyle, draws on her years of experience to recommend smart plants that will provide seasonal interest, and suggests hardscape materials that match many different aesthetics. Throughout, tips are supplemented by inspiring photographs that show a variety of successful designs from around the country. Use the tips found in The Less Is More Garden to turn your standard lot into a unique space that is lovely, family friendly, and low maintenance. With useful tips and design ideas anyone can use, The Less is More Garden helps design-savvy homeowners turn their small backyards into a unique space that is lovely to look at, family-friendly, and low maintenance.